1. Don’t try to go walking in very deep, powdery snow without snow shoes. 2. Piglet doesn’t really like sleeping out when it’s cold, and she gets cold very quickly when I stop, even to take pics. I think future winter trips will be confined to one night at a time, until such time as she enjoys them more (if ever). 3. The Ruffwear Web Master dog harness is absolutely brilliant, and worth every penny of the £40 I spent on it. So too is the Hurtta Pro Winter dog jacket: £50 well spent. Piglet’s Equafleece is great, but in very wet conditions (including snow) the Hurtta jacket is better because it doesn’t absorb water. 4. The Ruffwear doggy boots and socks are good, but Piglet refused to wear them after the first full day. I think she’d probably developed bruised claws, as I would if I were running in ill-fitting trainers. (Not that I have claws, but YKWIM…) The lessons for me, I think, are that I should trim P’s claws back a bit, over time, and get her used to wearing the boots when we walk in the woods, so that she’s used to them when she next needs them. Her wee feeties were fine in the snow, but I think the salt on the roads stung her paws a few times 😦 Protection against salt and grit may turn out to be the main benefit of the boots for Piglet. 5. My Paramo trail shirt thingy is absolutely excellent! I’ve had it for several years but I rarely use it. On this trip, though, I wore it daily with my Paramo salopettes and Icebreaker baselayer (and Paramo Viento jacket), and I didn’t need to wear my down smock at any stage when walking. I was so warm, in fact, that I rarely needed to wear gloves, and on all but one occasion the only gloves I needed, when I did actually wear them, were my skinny little under-glove things. That’s very unusual for me, as my hands are normally the first part of me to get cold, and once cold they’re very slow to warm up. I’m more-or-less recovered from the vile lurgy now. Thank you to all for the good wishes ♥ and commiserations to anybody who has still to fall foul of it. As was pointed out to me, though, it doesn’t last long. 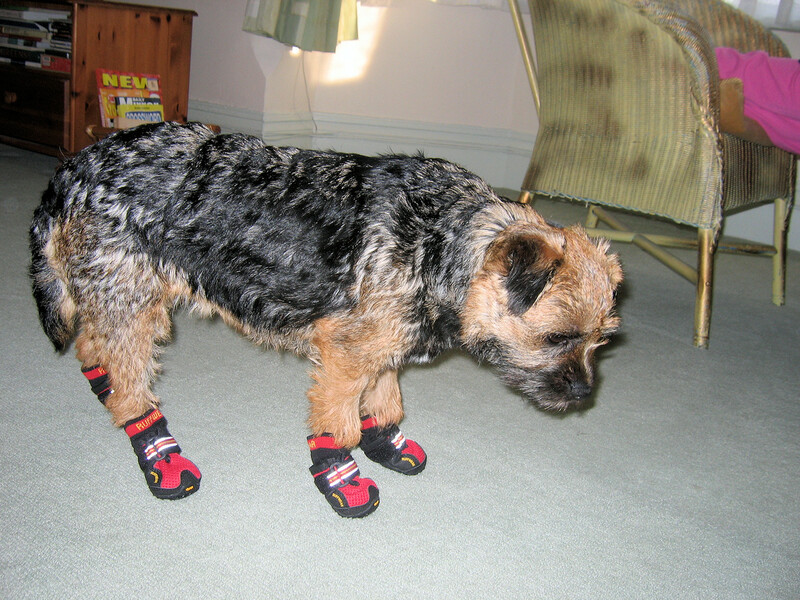 She’s very funny in her little boots *g* Initially she pranced around in them, hoping to shake them off, I think, but I’ve taken her for a walk around the block and she’s beginning to get the hang of them. I’ll trim her claws a little later–with my sister’s help, since Piggly doesn’t like having her claws trimmed–and hopefully that’ll ensure that her wee paws are comfy. We’re probably going over to Yorkshite this weekend to see Ali and Sue with their own wee monsters, and we’re off to the Dales on Monday to meet up with Colin. I’m getting hold of last-minute supplies today–camera batteries, gas, packets of hot choccy and soup, flapjacks and cheese & onion pasties–and plan to leave first thing in the morning. Piglet and I will be blogging as we go, barring disaster, so we’ll keep you all up to speed with our progress. Having looked at the piccies over on the Pieman’s blog earlier today, though, I’m now wondering whether we’re going to be able to make any progress at all! Not yet sure what the snow is like along the Skipton to Kirkby Stephen route. Bobs and Rose have made a speciality of going the extra mile on the service front since their business opened a few years ago now, but every time they come up trumps it brings a big smile to my face. I bought a NeoAir just before the Chally, and it was wonderful until quite recently, when it suddenly ‘blew’ (Bob tells me that’s the technical term), with a couple of chambers beginning to merge into one. It still works but I was concerned that the problem might get worse, so I dropped a line to Bob to ask whether T-Rest would still be willing to exchange it at this stage. Almost instantly I got a friendly email back telling me that this had been an acknowledged problem with the first batch (I had the last one of Bob’s first batch), and telling me also that they’d stick a replacement in the post for me that very afternoon. They did, and the following day my shiny new NeoAir arrived, complete with bag of Jelly Babies (consumed immediately–yum!) and a lovely little keyring with folding bag and hand-written note from Rose. Rose rang today to check that all was well, but I was out and so I missed her. I know that many of us around here consider Bobs and Rose to be friends, but it’s clear from reading testimonials all over the web over the course of the last few years that Bobs and Rose provide this level of service to absolutely *all* of their customers, and every single time. I have no idea how they manage to keep it all together between the two of them, with all the other demanding stuff they get up to, but I do know that every time I think of adding something interesting to my backpacking kit backpackinglight.co.uk is the very first place I look. Long may they continue! Okay, now most of it is in the bag. The only reason the spare phone and camera batteries aren’t also in there is that I forgot to put them in *g* I haven’t got a book yet, but I’ve never managed to get out of the Grasmere book shop without buying several so I’m sure I’ll be able to find something excellent there. So, here’s what I’m taking (the bones of it, anyway). Although Piggly has a nice Equafleece tankie for bombing around in cold, wet weather, I was a little concerned that it mightn’t be enough to protect her should the weather turn truly foul. I was also keen to get her a harness, partly so’s not to be pulling on her soft little neck, and partly because it’d be very helfpul to be able to lift her easily over streams and up scrambly things. Anyway, I drove over to Camddwr Canine, today, in Wales, and now she’s kitted out in lovely comfy things to keep her warm, dry and safe. She chose a Ruffwear Cloud Chaser Softshell, and a Hurtta padded harness. Phil and Alan y/day pointed out that it’s not a good idea to rely on one device for both blogging and GPS, and of course I agree with that. Bearing that in mind, d’y’all think that makes it any more feasible to use just the one device? If not then it currently seems that I’d need to buy, or enter into contracts for, two new devices, and that would be expensive at a time when I’m trying to conserve money. I suppose what I’m really asking about is how much of a hit on the battery would be likely to be involved in using the GPS function in that way. You are currently browsing the archives for the Kit category.